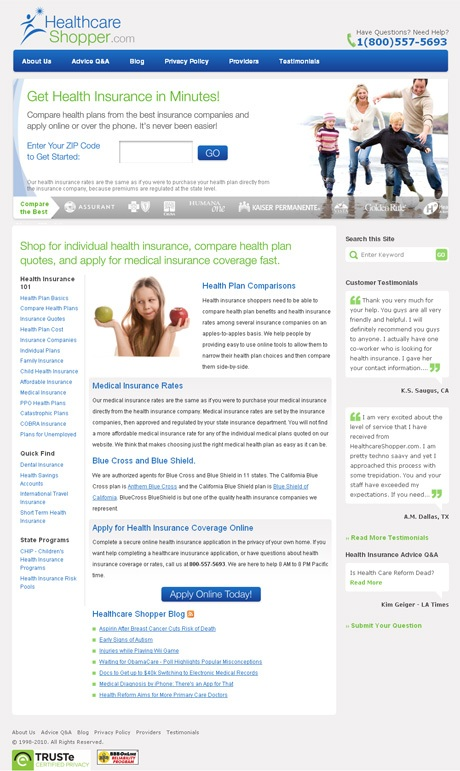 Healthcare Shopper Redesign :: International Portfolio :: PRO IT Service S.R.L. - Choose a professional and accessible service for your online image! 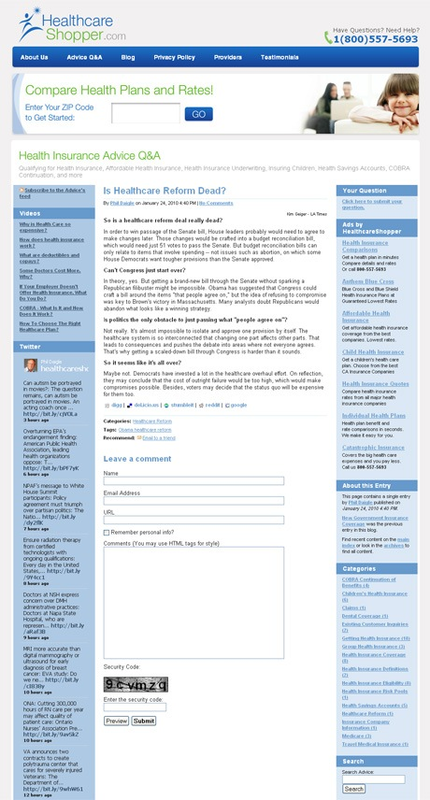 HealthCareShopper.com needed help for improving the Website architecture and for completely redesigning its look and feel. It's so nice to maintain a long term business relationship! This is the feeling I have when I think about Phil Daigle as well as most of my customers. Phil told me about his goals and gave me a completely redesigned Website interface which I've then hand coded in web page format based on xhtml v1.0 transitional and css v2.0. Then we've integrated the new design within the movable type installation the project is running on. The Website is quite complex, but two of its sections called "Advice" and "Blog" are movable type blogs based on the Unity Blue standard theme and on a TWT layout (thin, wide, thin). While the work on applying the new design to the other sections was quite complex, on these 2 blogs I've just integrated the site-wide header and tweaked a bit the Unity Blue theme to match the rest of the site. We've used this occasion to also upgrade movable type to the latest release in an attempt to benefit of the latest Six Apart efforts on making the movable type publishing platform even better. Over time we've added a couple of custom fields to the HeathcareShopper.com Website. At that time the most effective technique was to create the custom fields as individual columns inside the entries table from the movable type project mysql database. To allow that I've had to hack some movable type source code files. While initially hacking those source files wasn't such a big deal, over time that process became a pain as with each and every upgrade I've had to again hack a couple of movable type source files. The pain was even higher as very often I've had to recode the hacking from a version to another, as Six Apart continuously improved the movable type source files. Six Apart included a native custom fields facility starting from the v4.x series and this made us decide to switch from hacked custom fields to this native function so we could upgrade movable type easier. I've replicated the custom fields using the embedded movable type facility, but the problem was how to port the data from the hacked fields into the native one. Porting the data from hacked custom fields into the native custom fields' facility was a very tricky task. The only option I've had to make this possible was to code a custom plugin for it. The plugin I've coded allowed me to automate the data migration! The last thing I did on the custom fields task was to replace the movable type tags specific for the hacked custom fields with the movable type tags specific to the movable type native custom fields.